Danny Boyle (SLUMDOG MILLIONAIRE) is a great director with a kinetic visual style and a great use of dance music. He creates fast-paced films and all his best traits are evident in this new biopic of the iconic Apple founder, Steve Jobs. But this is not so much a Danny Boyle film as an Aaron Sorkin creation. The screenwriter famous for The West Wing and THE SOCIAL NETWORK has an instantly recognisable style - heavy dialogue - often combative - delivered at fast pace while the characters are on the move. On top of that style, Sorkin has also chosen a highly theatrical conceit for structuring this movie. Rather than a conventional biopic, he splits the film into three acts, each forty minutes long, and each taking place behind the scenes of one of Apple's iconic shareholder meeting. 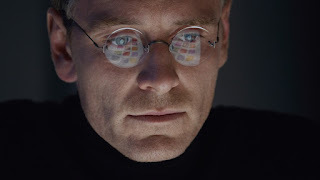 And in each segment, Steve Jobs, as played by Michael Fassbender (12 YEARS A SLAVE) confronts the same people. First up are the techies. We've got Seth Rogen (THE INTERVIEW) in an utterly straight role as Steve Wozniak, Apple co-founder and genuine computer engineer. He confronts Jobs about his desire to have everything frustratingly closed system and his unwillingness to credit the unsexy but cash-generative Apple II and its team. We've also got the marvellous Michael Stuhlbarg as Andy Herzfeld, the engineer who we see as being serially bullied by Jobs. Next up, we've got Jeff Daniels (The Newsroom) as John Sculley, the Apple CEO who was a true believer in Jobs until he kept on sinking money into beautiful machines that was so expensive as to be uncommercial, and eventually sacked him from his own company. There's also, per Sorkin, a weird father-son vibe going on that I'll come back to later on in this review. And finally we have the three women in Jobs' life. His colleague Joanna Hoffman (Kate Winslet - INSURGENT) exists in a state of unquestioning loyalty but wants Jobs to mend his relationship with the daughter whose paternity he denies and her hippie mother (Katherine Waterston). So far so good. The camera moves fast, the acting is basically good, apart from Kate Winslet acquiring a central european accent half way through the flick. But what really grates is Sorkin's reductionist psychology that has Jobs forever scarred by his being put up for adoption, and seems obsessed with giving us a happy ending. I found myself wondering why it was that this had to happen. After all, in THE SOCIAL NETWORK, Sorkin shows all the rough edges of Mark Zuckerberg and doesn't given him a satisfying emotional close, even though the real life Facebook founder was in fact in a stable relationship. What is it about our tactile obsessive relationship with i-devices that makes the film-makers think we need to feel good about Jobs? I found the final half hour of this film consequently inauthentic, forced, schmaltzy and undermining of all the good work done in its first two segments. STEVE JOBS opened last week in the USA, Australia, Israel and Canada. It opens on October 30th in Turkey, November 12th in Austria, the Czech Republic, Germany, Portugal and the UK; on December 3rd in the Netherlands; December 5th in Lithuania; January 1st in Spain; January 6th in Belgium; January 14th in Hungary; January 21st in Argentina, Brazil, Colombia, Italy, Mexico, Russia, Singapore, Norway, Sweden and Vietnam.